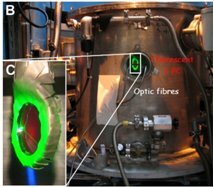 Coupling of laser excitation and inelastic neutron scattering measurement. View of the sample environment on MIBEMOL neutron spectrometer during illumination experiments on C-PC. Light-harvesting antennae are pigment-protein complexes involved in light-absorption and excitation energy transfer (EET) to the so-called "reaction center" complexes, where the photochemical processes of photosynthesis take place. C-phycocyanin (C-PC) is one component of the phycobilisome, the light-harvesting system of cyanobacteria . In phycobilisomes, EET is a highly efficient key event [2-3], where light-induced dynamics of the antenna pigment/protein complexes may play a role [4-7].